July 18, 2018 - Are you a manufacturer or researcher in the sawmill industry offering an innovative optimization or automation option that can help modern sawmill operations succeed? Send us your proposal to present at OptiSaw. 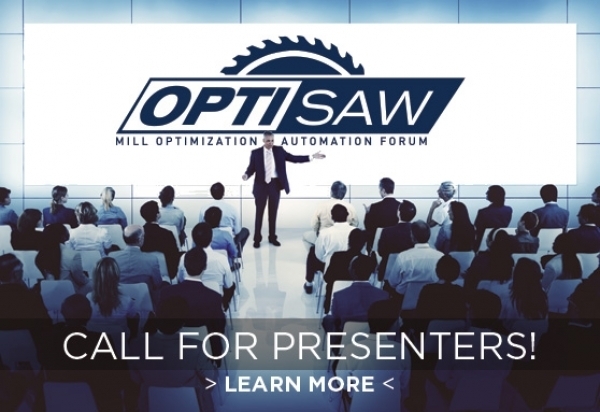 OptiSaw is a one-day workshop focused on the future of optimization and automation in sawmilling, including challenges and opportunities on the cutting edge of this side of the industry. Taking place in Montreal on Nov. 28, OptiSaw is a time-effective and affordable learning and networking opportunity for those driving the future of sawmilling operations. We welcome sawmill management and owners, process engineers, continual improvement managers, optimization staff, researchers and design consultants. Registration for this exclusive event is limited. Previous presentations have covered artificial intelligence at the sawmill, mass timber opportunities, automating species separation, and big data in the forest industry. Presentations that offer an in-depth case study, with input or participation from the sawmill staff involved, will be well received. Send your presentation proposal to Canadian Forest Industries editor Maria Church, mchurch@annexbusinessmedia.com, by July 31.